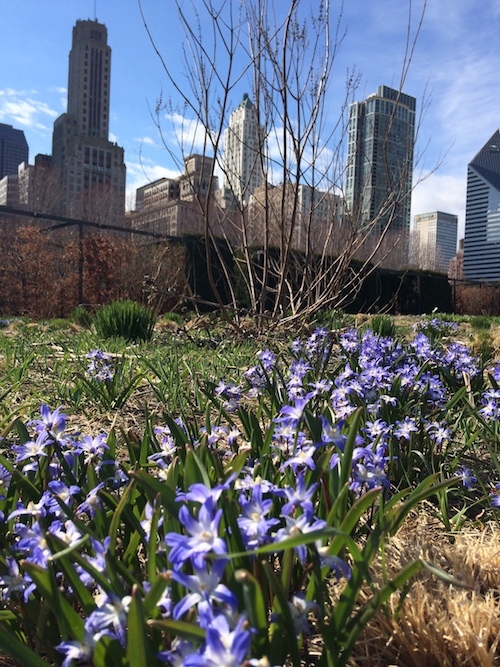 The MSHS series of showings of Five Seasons: The Gardens of Piet Oudolf has been extremely popular during our still chilly final days of this long winter. I attended the sold-out showing at the Riverview Theatre in south Minneapolis a week ago, and have been thinking about it ever since. Gardens can be beautiful in all seasons. This is Oudolf’s Lurie Garden in Chicago in April. Piet Oudolf is one of (if not the) most influential contemporary garden designers in the world. His gardens include the High Line in New York City, the lovely Lurie Garden in Chicago and a garden that was the focus of the film, the garden at Hauser & Wirth Somerset in southwest England. During the film, viewers watch Oudolf as he goes from drawings to plantings to the completed garden across the five seasons. Much of the time, he is at his stunning home and garden at Hummelo in the Netherlands, where it’s fascinating to watch him draw the Somerset garden and soothing to see him walk through his home garden in various seasons of bloom and decay. Oudolf also travels during the year—to New York, the Upper Midwest to visit a prairie and, in an amusing scene, to Texas, where he is blown away by both the wildflower bloom and the barbeque! 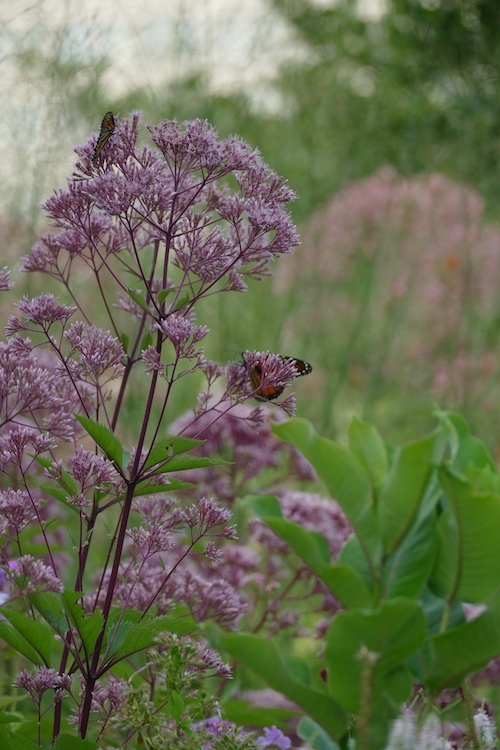 Choose plants that bloom in late summer, like Joe Pye weed at Lurie Garden. In his gardens, Piet Oudolf encourages visitors to rethink what is beautiful and what is appropriate in a garden. The tall grasses and prairie-style plants that inhabit many of his gardens look “native” to us in the Upper Midwest (because they are native here), but in Europe, where he is based, they are exotics. “If they behave, they can stay,” Oudolf says. He uses those plants in part because they look intriguing and beautiful as “skeletons,” which is how Oudolf describes plants past bloom and heading into winter. His work is meaningful here because it is about extending the growing season and finding plants that can hold up and still look dynamic in late fall and into winter. He also offers much practical advice to gardeners, especially those of us in the North. First, he says, find something that blooms in early to mid spring and something that looks lovely in fall, and the rest will take care of itself. He uses plants in great, sweeping masses and while home gardeners cannot re-create that look entirely, choosing fewer plants and planting more of them in groups is a restraint many of us plant-loving gardens should try to employ. Finally, Oudolf’s gardens may look wild, but they are not. Maintenance, such as cutting plants back in spring, and occasional editing out of any plants that become aggressive is necessary in any garden. There is one more showing of the film at 6 p.m., Thursday, March 28 at the Minnesota Landscape Arboretum. Register with MSHS as soon as possible to get your tickets to see this remarkable movie. 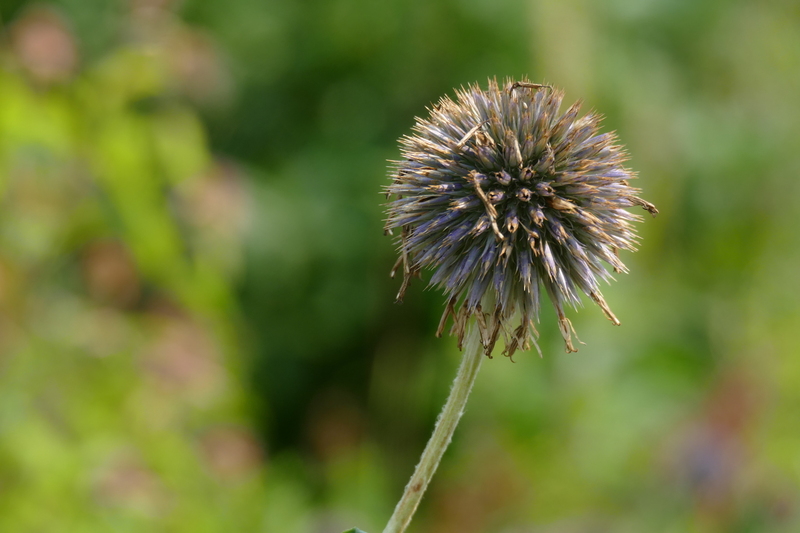 Plants past bloom still have beauty, such as rattlesnake master. This was taken in Lurie Garden in August. Human aesthetics may call for a simplification of the plant list but ecology likes diversification. This seems a difficult balance to achieve. I’m not certain Mary’s interpretation of simplification of design is accurate. Granted, I could study Oudolf more but another pair of “New Perrenialists” I’ve read recently, Thomas Rainer and Claudia West, address this apparent conflict in layers. They identify more visible architectural and thematic layers which are “distilled and amplified” and an underlying less visible functional layer which is as diverse as can be. This functional layer fills the gaps, does much of the practical work, and addresses a broad set of ecological needs. I wonder if Oudolf uses a similar approach.